I’m not a big fan of vegetarian fare, but this lasagna has to be the best non-meat meal I’ve ever had. I’ve made it as one of many dishes at our holiday parties, and it’s always the first to disappear. This one does take awhile to make, and preparation is pretty involved. Not to say that it’s difficult to make, actually, it’s rather easy. And when it’s done, you and your family or friends will think you’re the best chef in town. The recipe was published in the New York Times by Martha Rose Shulman, a cookbook author who focuses on healthful and delicious meals. * Note that you can add about 25-50% to the asterisked ingredients for a more robust finished product. As originally written, the recipe is a bit anemic. 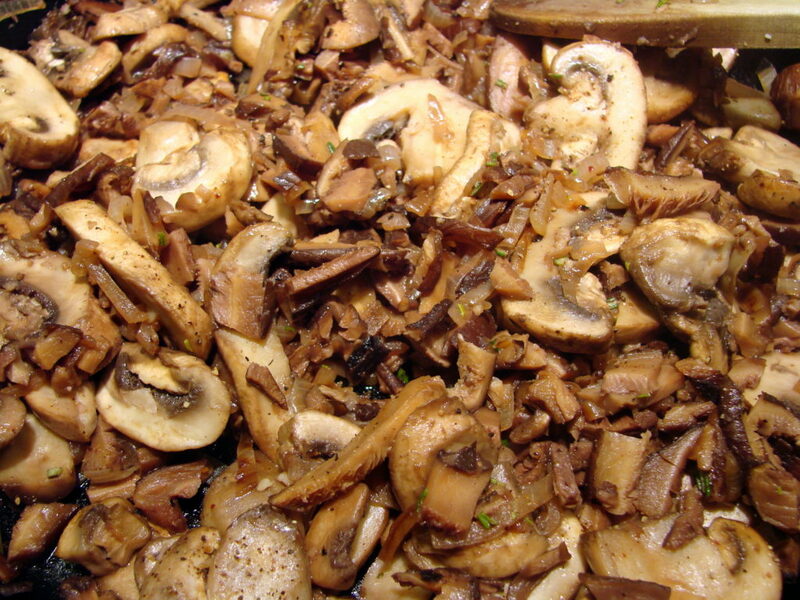 Put the dried mushrooms in a bowl that holds more than 2 cups of water and add 2 cups of boiling water. Let them soak for about 30 minutes (you can prepare other ingredients during this time). Note: you’ll have to reserve 1.5 cups of the soaking liquid for later. 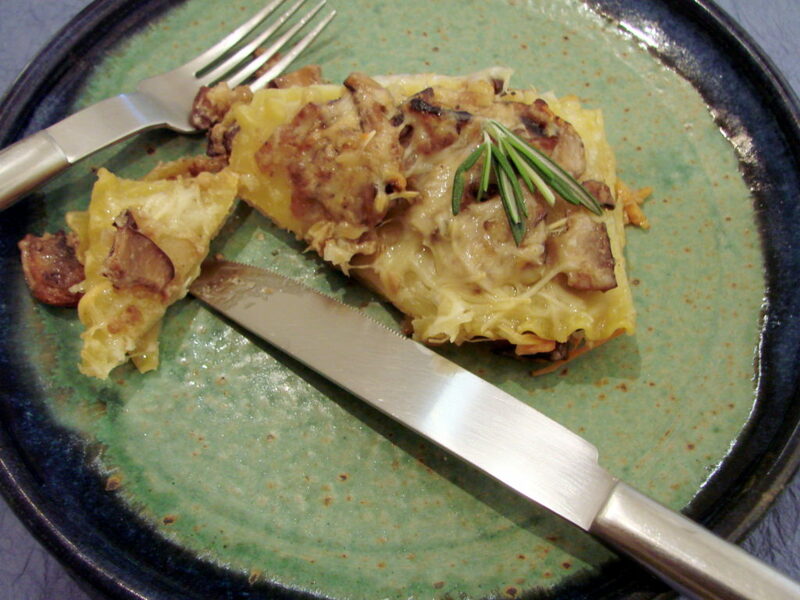 Place a strainer over a bowl, line it with cheesecloth or paper towels, and drain the mushrooms. Squeeze the mushroom juice out and save for another recipe, if you wish. If using shiitakes, cut away the stems and throw them out. Rinse the mushrooms until they are free of sand. Squeeze dry, chop and set aside. Heat 1T olive oil in a large, heavy skillet over medium heat and add the shallots or onion. Cook, stirring often, until tender. 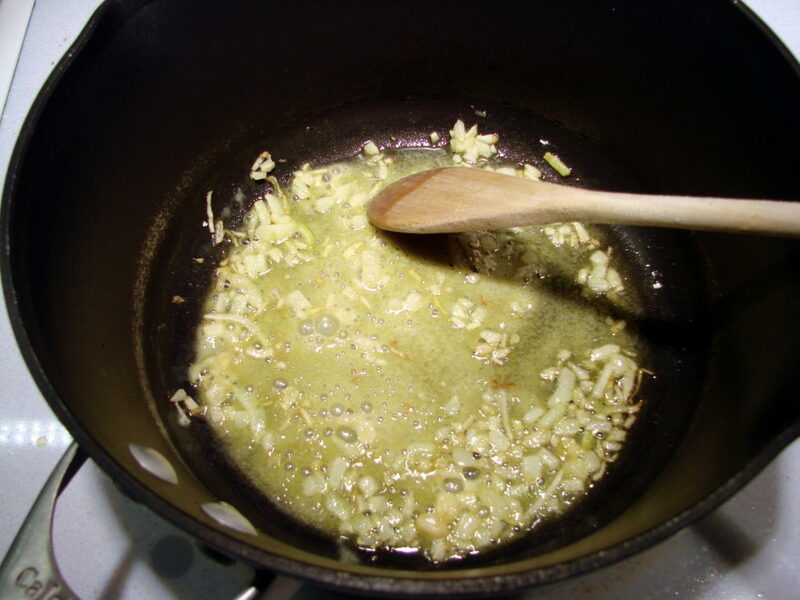 Add the garlic, stir together for about 30 seconds, then add the fresh and reconstituted mushrooms and salt to taste. 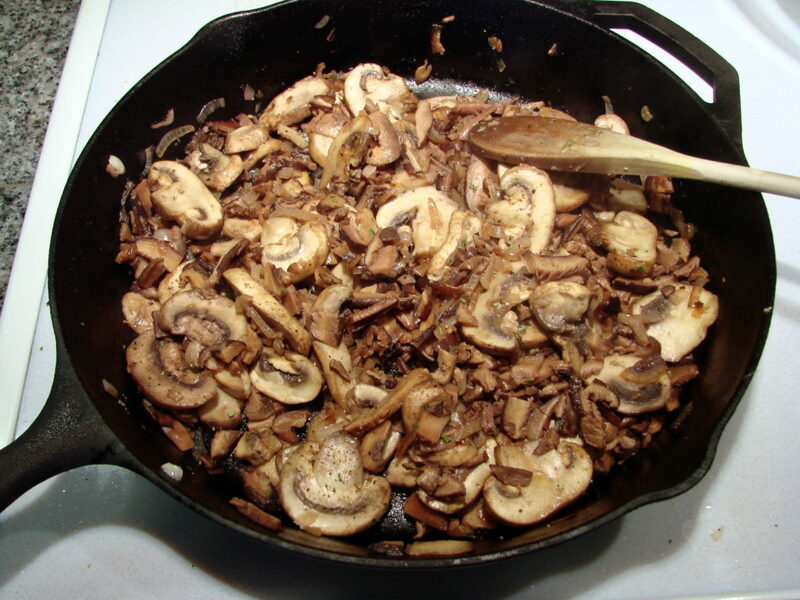 Cook, stirring often, until the mushrooms begin to soften and sweat. Add the wine and turn the heat to high. Cook, stirring, until the liquid boils down and glazes the mushrooms. Add thyme and stir in the mushroom soaking liquid. Bring to a simmer and cook, stirring often, until the mushrooms are thoroughly tender and fragrant and the surrounding broth has reduced by a little more than half. Remove from heat, stir in some freshly ground pepper, to taste. Both kinds of mushrooms and shallots cooking. Waiting for the mushrooms to sweat. 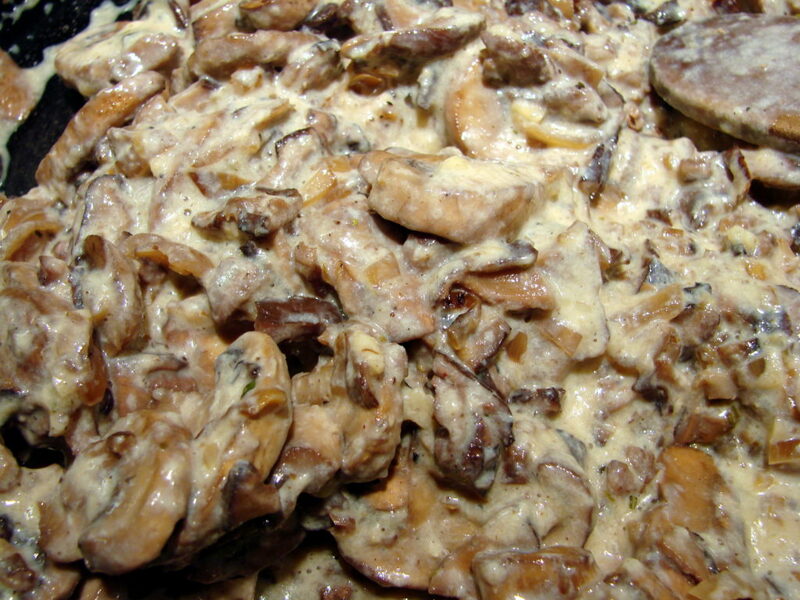 Mushroom mixture with wine, rosemary and pepper–cooling. Now it’s time to make the béchamel. Heat the oil over medium heat in a heavy saucepan. 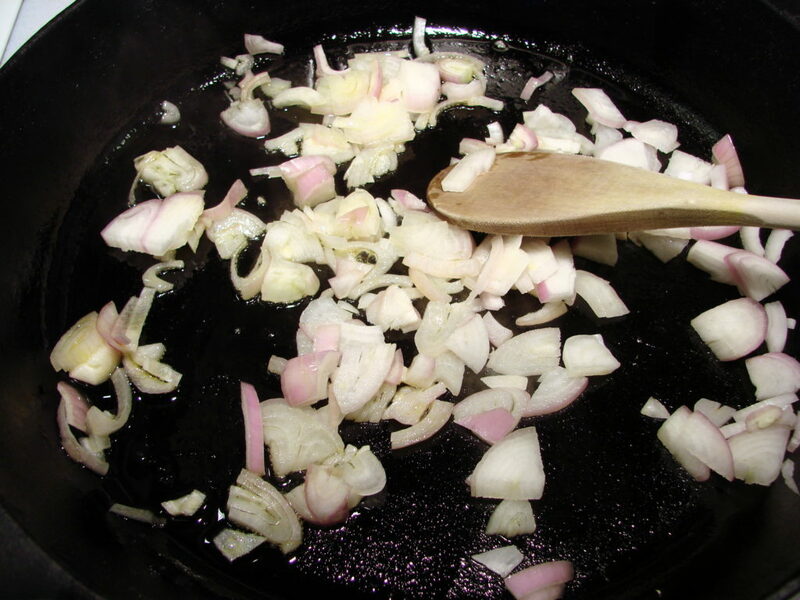 Add the shallot or onion and cook, stirring, until softened. Stir in the flour and cook, stirring often, for about 3 minutes, until smooth and bubbling, but not browned. It should have the texture of wet sand. 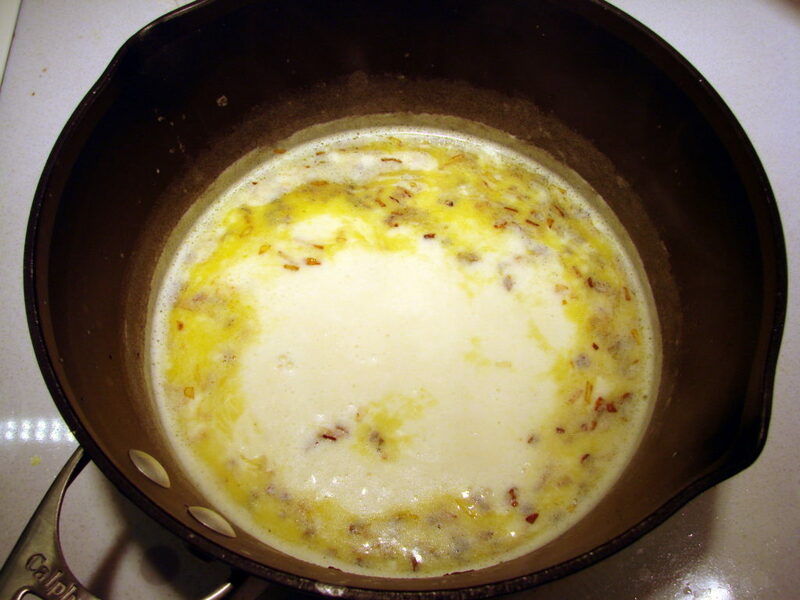 Whisk in the milk all at once and bring to a simmer, whisking the entire time, until the mixture begins to thicken. Turn the heat to very low and simmer, stirring often with a whisk and scraping the bottom and edges of the pan until the sauce is thick and has lost its raw-flour taste. Season with salt and pepper. 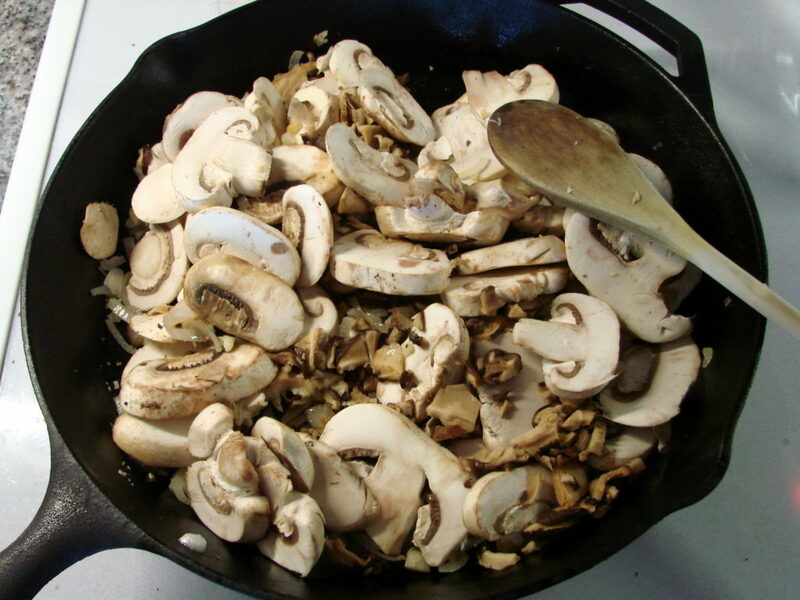 Add while hot into the pan with the mushrooms. Starting the bechamel with shallots, flour and oil. Milk added and bechamel thickening. 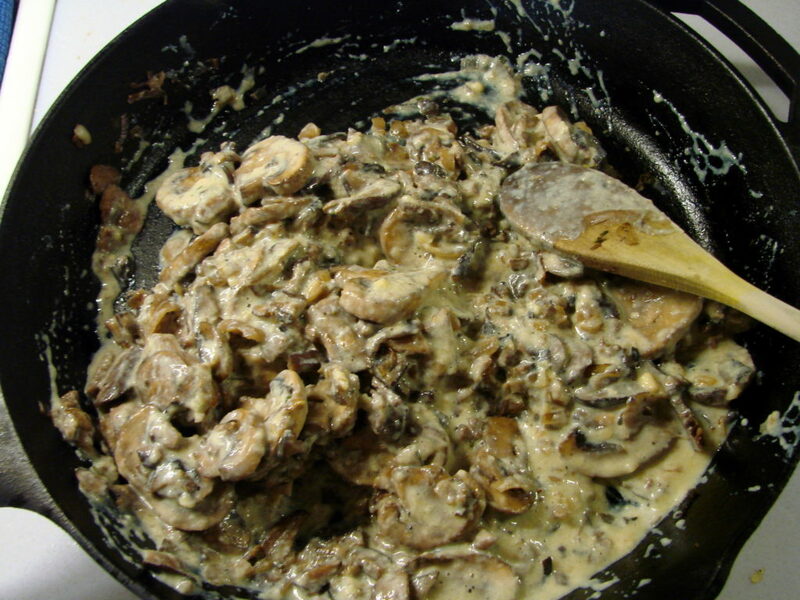 Adding finished bechamel into mushrooms. Here’s the best part: assembling the lasagna. Heat your oven to 350 degrees. Oil or butter a 2-quart rectangular baking dish (aka, lasagna dish). 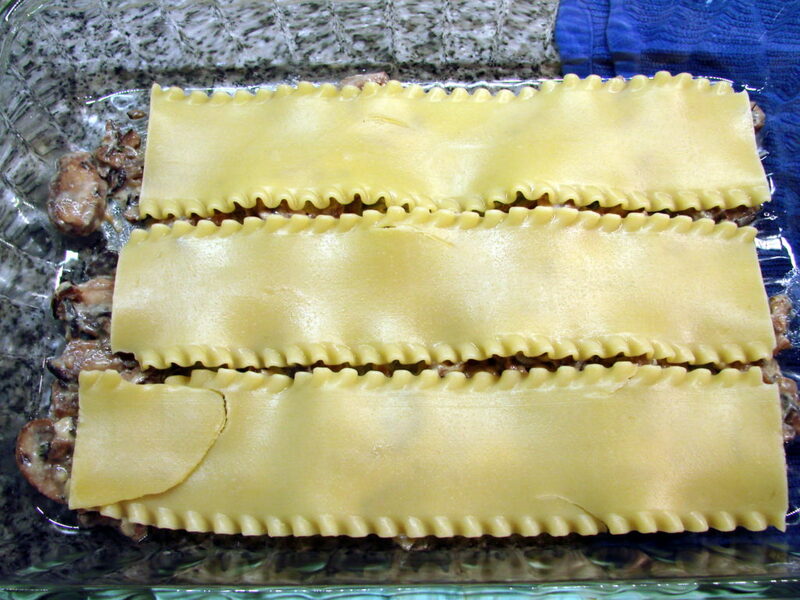 Bring a large pot of water to a boil, salt generously and add 3 or 4 lasagna noodles for one layer. Cook only until flexible and remove from the pan and set on a kitchen towel to drain and cool a bit. 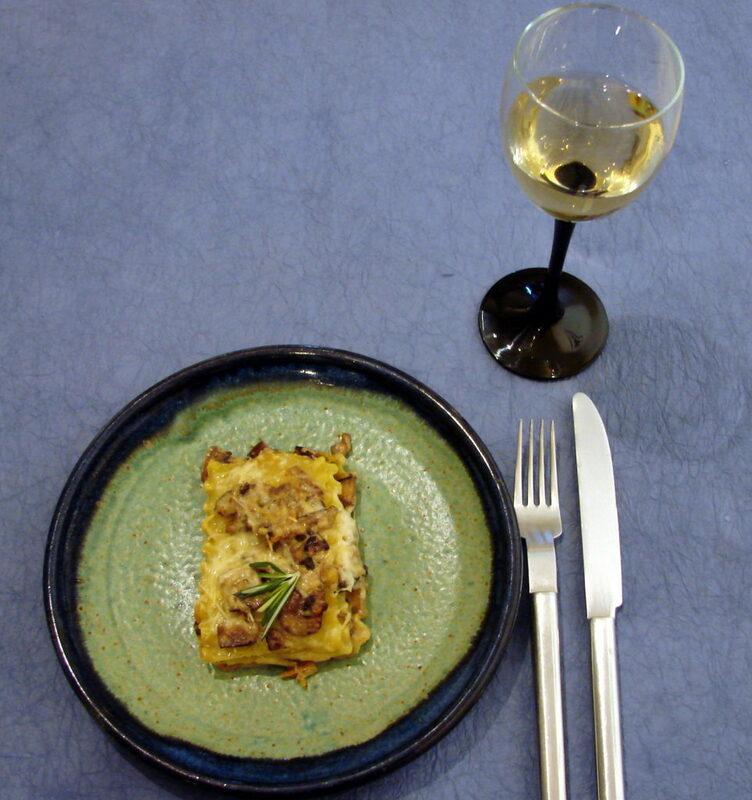 Spoon a thin layer of béchamel and mushrooms over the bottom of the dish. Top with a layer of noodles. 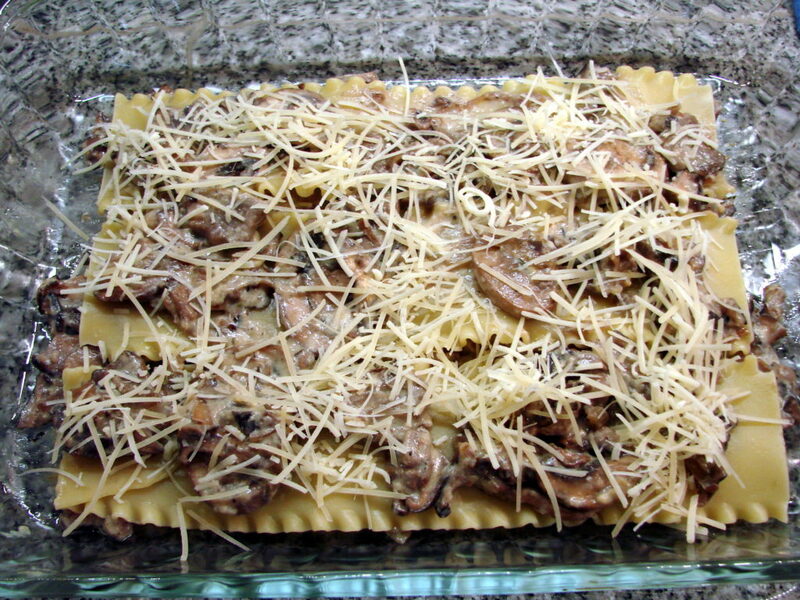 Spread more of the mushroom/béchamel mixture over the noodles and top with a layer of Parmesan cheese. 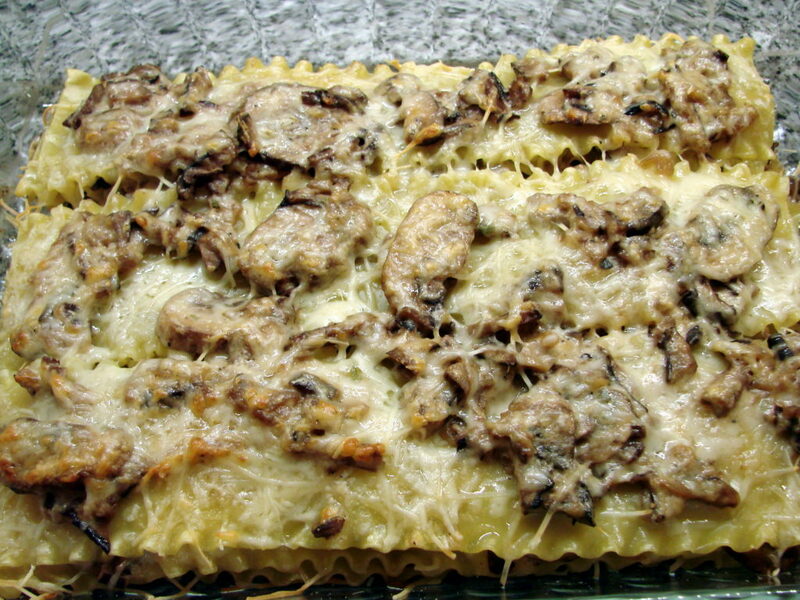 Cook the next layer of noodles and continue to repeat the layers (3 or 4, depending if you made more mushrooms/béchamel than the recipe called for), ending with a layer of the mushroom/béchamel mixture topped with Parmesan. Cover with foil and place in the oven. Bake for 30 minutes, after which, remove the foil, and if you want the edges of the noodles crispy and the top lightly browned, continue to bake uncovered for another 5 to 10 minutes.